Thanks to Troops Out for this: In a national broadcast exclusive interview world-renowned political dissident and linguist Noam Chomsky speaks about the release of more than 250,000 secret U.S. State Department cables by WikiLeaks. In 1971, Chomsky helped government whistleblower Daniel Ellsberg release the Pentagon Papers, a top-secret internal U.S. account of the Vietnam War in 1971. See Chomksy interviewed on Wikileaks here. Wikileaks has transformed activism, raising its scope and impact. Its detractors are many, but it defenders are all of us. 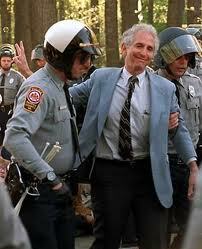 Daniel Ellsberg (pictured above) is one of the best known in America, who has recently written an open letter to Amazon criticizing its decision to deny service to Wikileaks. But there are also Ray McGovern, Ron Paul and Noam Chomsky. Our friend Phil Weiss has also written an eloquent tribute to Wikileaks’s achievements. But by far the most impressive commentator on the issue is constitutional law attorney and Salon blogger Glenn Greenwald. For a delightful demolition of the naysayers and their anaemic arguments watch Greenwald debate Steven Aftergood of FAS on Democracy Now.